Twitter‘s traffic skyrocketed 33% over the summer, according to one survey. Meanwhile Digg’s influence was fading even before its controversial makeover. But a more meaningful measure of Twitter’s growth is how many people are using it, and a new survey has revealed that Twitter’s seen nothing less than staggering growth over recent months. In August, Twitter processed some 2.64 billion tweets–that’s 85 million per day–up 33% over the figure for May. 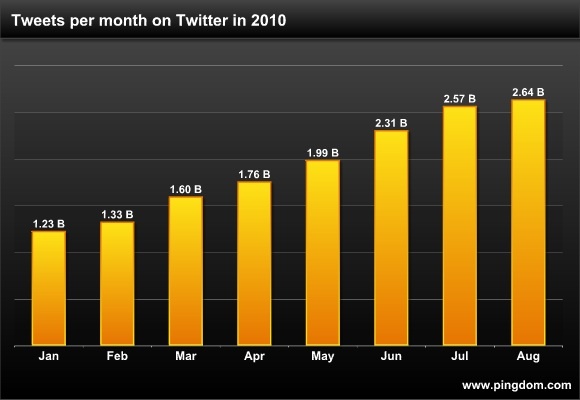 The August figure is more than double January’s figure, of 1.23 billion tweets, in fact. In other words, Twitter’s growing at an incredible rate, and its users aren’t just blindly signing up and not taking part–they’re actively using the system, no doubt leveraging all the new uses it’s being put to (like news reading, photo sharing, celebrity access, trend spotting and Web story discovery). That last aspect is the killer one, when you look at the fortunes of another famous (possibly paradigm-defining) Web story discovery network: Digg. As revealed by statistics generated by Gawker’s marketing team, Digg has moved from being the dominant traffic driver among its peer services in October 2009 to coming in in fourth place after Facebook, Twitter, and Stumbleupon. The growth of Facebook in the stats is expected, Twitter’s growth burst is evident, and Stumbleupon’s increasing importance is something of a surprise (possibly biased by the particular sharing tech highlighted on Gawker’s sites), but the clear loser is Digg. And then the new Digg arrived, and a comparison with Reddit shows that things may have got even worse in the last week. Even when you discount the amusing/irritating hijacking of New Digg’s frontpage by Reddit (thanks to angry Diggers) Reddit’s grabbing big chunks of Digg’s traffic. 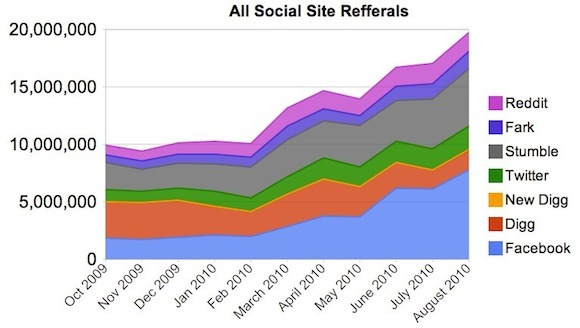 So here’s what we think is going on: Digg may have been early in the social net/web reffering game, but the entire social net phenomenon has since grown. Facebook has been steadily adding in new powers almost every week. Twitter has hit a nerve among Netizens, probably by keeping things extraordinarily simple, adopting new tech (like its new iPad app) and co-opting newly invented uses discovered by its users into official systems. Digg hasn’t particularly innovated or listened to the requests of its users and has gone from being crowdsourced to what Mark Suster of VC firm GRP Partners recently called “mafia sourcing.” Now that Digg is trying to open its system back up, the mafia isn’t happy. A new generation of fans will have to work hard to bring Digg back into the limelight. But they’ll be tempted–as the numbers bear out–to pour their time into Twitter or Facebook, which continue to leave Digg in the dust.